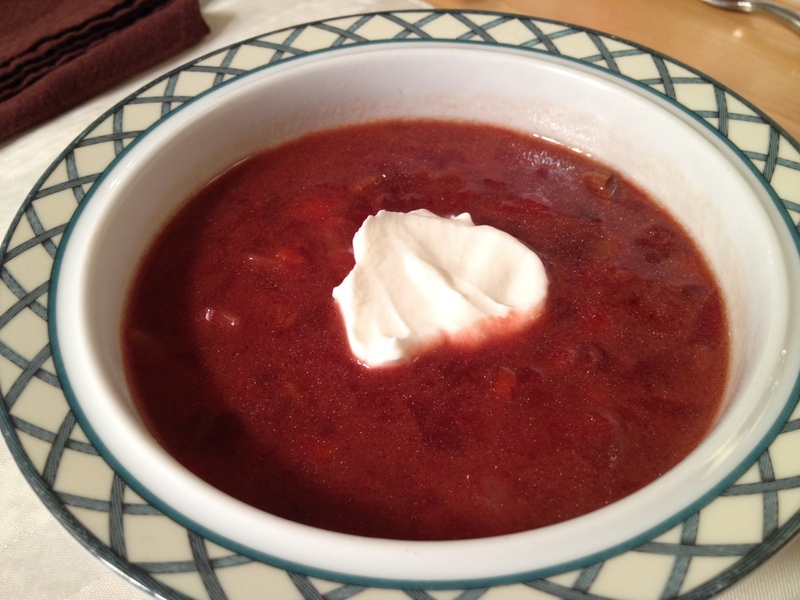 Borscht is a traditional Ukranian soup/stew and makes a great hearty winter meal. My father is part Ukranian and would have my mom make this for us a few times every winter and always on Valentine’s Day (because of the soup’s deep red color). 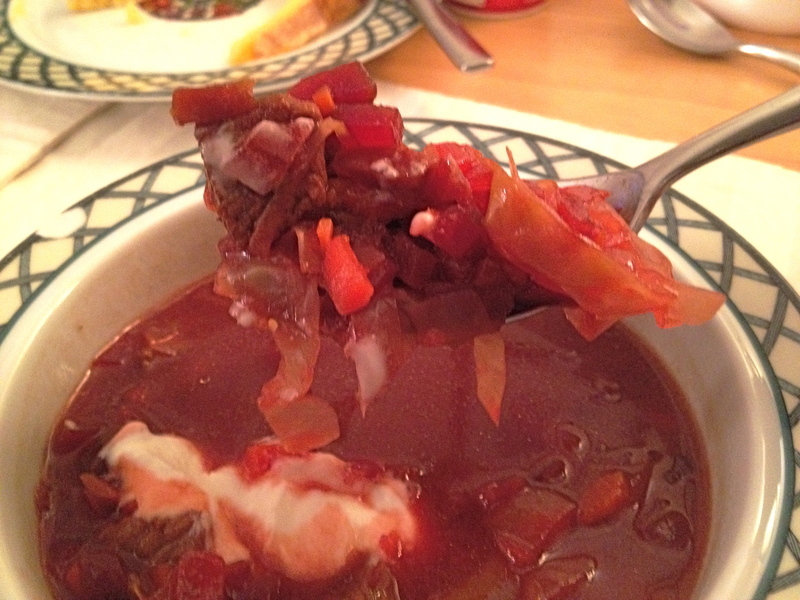 My mother used a recipe from the Joy of Cooking that I adapted to include meat and make the borscht more of a soup-consistency. The main ingredients are beets and cabbage, two of the NY Times 11 Best Foods You Aren’t Eating, so while this is another recipe that doesn’t necessarily photograph well, it is an easy, savory winter meal that is also very healthy. And delicious! 1. Chop the beets, carrots, onion and cabbage in advance. Set aside. 2. Lightly dredge the cubes of meat in a bowl of flour. 3. Heat vegetable oil over medium-high heat in a saute pan. Add meat and cook until lightly browned. 4. Heat butter in soup pot over medium-low heat. Once melted, add beets, carrots and onions. Stirring continuously, cook until softened. About 8 minutes. 5. Add beef stock, water, cabbage, red wine vinegar and meat to pot. Bring to a bubbling simmer. Once simmering, lower heat, partially cover soup with lid, and continue to simmer for 30 minutes. 6. Serve hot. Garnish each serving with a dollop of sour cream (or 0% Greek yogurt) and dill. Note: This soup also tastes great cold. I like it even better reheated as leftovers the next day though because the flavor intensifies and the broth thickens.